Is PRP Hair Regeneration Right for You? Hair is a fleeting luxury for many people. Millions of people - men and women - struggle with hair loss. The reasons for hair loss vary: disease, genetics, stress and hormonal imbalance. Whatever the cause, everyone wants a solution and to enjoy a full head of hair. For Women, hair loss can be absolutely devastating. A woman's hair is like her crown - it can define her whole look, feel and style. As any woman knows who is suffering, thinning hair is a serious problem that can cause low self-esteem and deep embarrassment if left untreated. Hair loss seems to be one of those inevitable effects of aging most men cannot escape. While it may not affect some as early as others, it is a fact every man will likely face as the year's tick by. However, new technology is offering a permanent, effect and organic solution. People who desire a non-surgical regrowth strategy that is safe and effective choose the Studio Scalp Hair Regrowth Procedure. This innovative procedure combines ACell, PRP and nutrients injected into the scalp to encourage hair growth. ACell's MatriStem (ACell) is a Medical Device sanctioned by the FDA for use in plastic and reconstructive surgery. Structurally, ACell is a biomatrix that repairs and remodels damaged tissue. Effective for both male and female pattern hair loss, ACell + PRP has also regrown hair in alopecia areata, eyebrow hypotrichosis and other patient cases with non-hereditary hair loss. How does Regenerative Hair Regrowth Work? The Regenerative Hair Regrowth treatment takes about 90 minutes to complete. First, a blood sample is obtained which is specially processed to produce the PRP. A local anesthetic is then administered to completely numb the scalp treatment area. The ACell, PRP, and nutrients are combined and then administered via a series of injections over the full scalp or in a localized treatment area such as the eyebrows or beard. The Recovery from the procedure is typically uneventful. Pain is easily managed in most cases with non-narcotic analgesic medication such as Ibuprofen. Some mild swelling of the forehead is occasionally seen 1-2 days after injections. This is normal and will resolve in 48 hours. Avoiding vigorous activity is recommended until the swelling is gone. There is no other downtime or noticeable effects of the procedure. 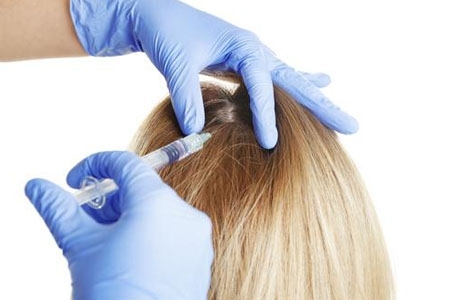 Patients can wash their hair normally immediately after the injections. New hair growth can be seen as early as 2 months, but is typically evident between 4-8 months and will continue to improve up to a year after treatment. To date, results have been maintained without additional injections for up to 2 years in many patients, but no long-term data is yet available to conclude that ACell induced hair growth is permanent.